Unlike French White II, however, the rims of the Casual Elegance Line have embossed designs on them. I know of three different designs in this product line... Though at least one of the "books" specifically states that there was only one design in this shape. The casseroles are embossed on the bottom, rather poorly I might add, with an L-Series. as well as various other Round and Oval pieces such as L-20, L-22 & L-23 (Round) and the L-30 & L-31 (Oval). I currently have no other information on what volume measurements these pieces have. The Broil and Bake Platters are embossed with an H-Series instead of "L", my assumption is because the L-15 was already used on the Open Roaster. Hopefully this help shed some light on a somewhat obscure and late released Corningware Product line. To make matters more confusing, I am pretty sure that I have seen these in stoneware just like French White and French White II. So check the bottoms for firing rings to make sure you are not getting a hunk of stoneware! I found a White Flora marked L32 a while back and bought it for 5 dollars. I think it is quite beautiful, but am wondering what to so with it? Any ideas from anybody? I have the white flora in the oblong roaster, small and large oval and small and large round; wedding presents in December 1996. (20 years ago!) Still use them several times a month. From memory the large held 2.1 litre, the small maybe 1.8 litre? Useful in the oven for gratin, shepherd's pie, lasagne etc. If a piece of casual elegance is clearly NOT stoneware, is it pyroceram and can it be used on a stove top? Yes.. it's a little cumbersome, like using French White on the stove, but it IS safe for stove top use. I have the large oval Casual Elegance casserole dish (L-62) in the White Flora Pattern. On the bottom, "MADE IN USA" is stamped on one side and "NO STOVETOP OR BROILER" is stamped on the other side. I also have a large round casserole dish (L-22) in the same White Flora pattern - but on the bottom, it's stamped "OVEN - BROILER - MICROWAVE - FREEZER". As far as I can tell, both are pyroceram. (They are definitely not stoneware.) Before they started making stoneware, did Corning transition to making some pyroceram pieces in the Casual Elegance line that were not intended for stovetop use? Technically, the shape of Casual Elegance makes stovetop use difficult.. this also holds true for French White items,. So it's possible Corning started marking them as not for stovetop use... The no broiler may also have to so with the shape but as far as I am aware, they were only made of Pyroceram or Stoneware. Interesting. Thank you. 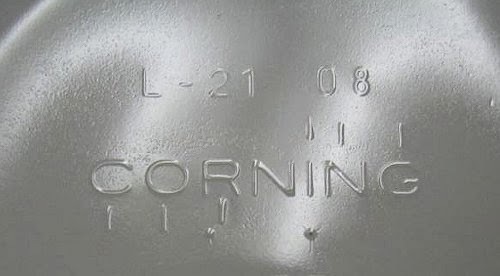 I found an L21 in a thrift store and had never seen an embossed design on corning. I used various search terms on your site and many others and could find nothing. The "L" was very faint and I used "A".Finally got a magnifying glass to find more clues. Now I can relax:). Merry Christmas. So fascinating! Super helpful article, thank you! So far I have found the oval bowls and raised roasters in a see through cobalt blue as well as the white. It took me forever to figure out what they were. Today I found the round bowl (L-22) in cobalt blue with a new pattern not identified in your post - a small flourish or swirl that repeats all around the edge. I was hoping to find what on earth it was called. No luck so far, although I did find one other photo of it elsewhere online! Is there some way to send you a photo, that perhaps you may want to update this post? Suuuper appreciate you writing about this series though. There is so little info on it elsewhere. The Cobalt, Spring Green and Amethyst colors are actually Pyrex, so please do not attempt to use them on the stove top. That particular line from Pyrex was also available in other patterns besides the 2 that are found in Corning Ware. The Corningware Menuette - Quartet or Duette?